Months after being named the city with world’s most polluted air, here comes another blow for Delhi. A study, carried out by non-profit The Nature Conservancy, says that India’s capital city is world’s second most water-stressed city, just behind Tokyo. The study was carried out after surveying the water infrastructure of world's 500 cities with population of more than 750,000 (called large cities in the study). Its results have been published in journal Global Environmental Change. While Mexico City is the world’s third stressed city, China’s Shanghai and Beijing and India’s Hyderabad, Chennai and Bengaluru are also among most water-stressed cities. According to researchers, one-quarter of the largest cities suffering from water stress account for a significant amount of economic activity—estimated at US $4.8 trillion. While large cities occupy only one per cent of the Earth's land surface, their source watersheds cover 41 per cent of that surface; so the raw water quality supplied into cities depends on the land use of this much larger area, says study. The research further highlights that financial limitations on infrastructure leave poorer cities in greater water stress, as they have to survive on closer water sources. The study found that cities with low per-capita income rely on water sources 26 km away on an average, while cities with high per-capita income utilise sources 57 km away on average. The study states that water shortages are more pressing than climate change and the impact of water stress is one of the most important business risks for the agri-food business globally. What fuels water stress in cities? Large cities obtain about 78 per cent of their water from surface sources, some of which are far away. Cumulatively, large cities moved/circulated 504 billion litres of water a day over a distance of about 27,000 km, and the upstream contributing area of urban water sources is 41 per cent of the global land surface. Despite this infrastructure, one in four cities, comprising about US $4.8 trillion in economic activities, remains water-stressed due to geographical and financial limitations. Cities, by their nature, spatially concentrate the water demands of thousands or millions of people into a small area, which by itself would increase stress on finite supplies of available freshwater near the city centre. The urban water infrastructure of these cities then goes farther to exploit new sources of surface water, groundwater or desalination and escape water stress. But there are also times when this infrastructure is not enough to escape that stress and fuels water scarcity. Past research has shown that as cities grow in population, the total water needed for adequate municipal supply grows as well. 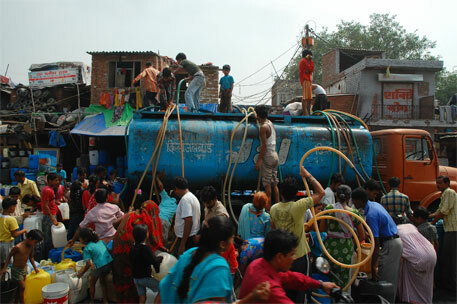 This increase in total municipal water demand is driven not just by the increase in urban population, but also by a tendency for economic development to increase the fraction of the urban population that uses municipal supply rather than other sources such as local wells or private water vendors as that is considered to be cleaner. Indeed a timely reminder to the readers to get into making a meaningful and sustainable engagement with SCP-sustainable consumption and production mindset. How will homes for all sloganeering for the achche din promise exacerbate this water stress does not require cerebral sophistication.